With inflation going up the price of the dollar keeps fluctuating so the act of keeping your savings in a bank is decreasing daily… Why not put your money into something safer like precious metals, especially GOLD! 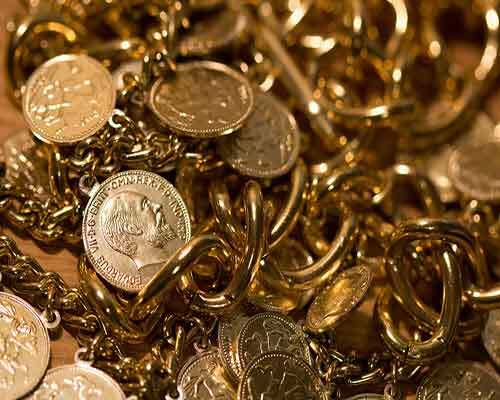 Buying Gold from Covina Coin & Jewelry in Monrovia California can increase your wealth and hedge your savings in a safer place. Since our everyday dollar is only backed by the US Government, this makes buying Gold so much better since there is a limited amount of Gold on earth which makes it precious and valuable. It’s never been easier to buy gold in Monrovia, California. Covina Coin and Jewelry offers everyone the most competitive pricing with the best customer service! One of the most popular gold dealers in Monrovia, California, Covina Coin and Jewelry can answer all your questions about Gold Coins, Gold Bullion, Gold Bars and More. A family-owned shop run by the Lenharts, Covina Coin and Jewelry carries a wide selection of both coins and collectible paper currency. They mainly deal in U.S. precious metal currency (both numismatic, in the form of Silver Dollar Coins and Bullion, in the form of newer Silver Eagles). However, they also carry a selection of German and Mexican coins, as well. They also stock gold and silver bars and various other precious metal odds and ends. They even have a line of ancient coins for those looking for something truly out of the ordinary. Make sure you give the friendly professionals here at Covina Coin & Jewelry next time you’re looking to buy Gold in Monrovia California. Covina Coin & Jewelry is family owned and operated. We have been serving collectors and investors in Southern California for over 40 years. Covina Coin and Jewelry also provides foreign currency exchange services and we are a local buyer of most foreign and ancient coins and currency. Covina Coin and Jewelry also is a leading buyer and seller of gold, silver and platinum bullion, bars and coins. © 2019 COVINA COIN & JEWELRY, 204 S. Citrus Ave., Covina, CA 91723. All rights reserved.